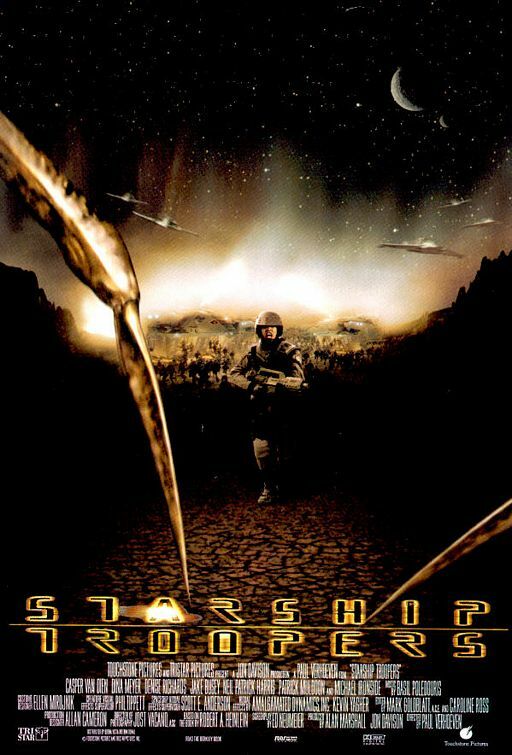 Screening in NYC: STARSHIP TROOPERS (1997). 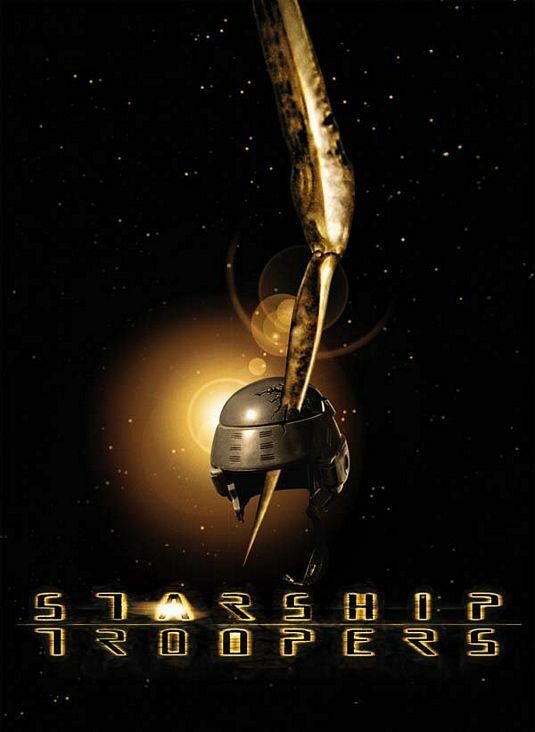 When STARSHIP TROOPERS was released, the TV spots went heavy on the use of Blur’s “Song #2” (Woo-hoo!) and explosions and the Melrose Place prettiness of its cast. I remember seeing those ads. 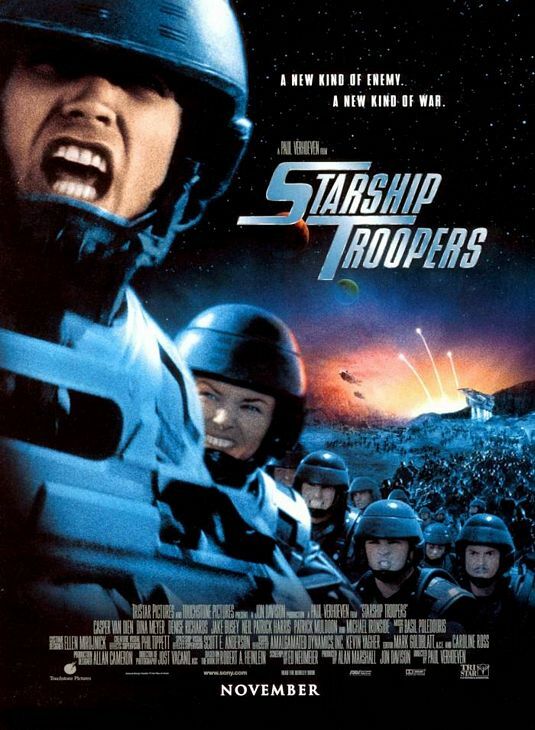 I remember how the marketing went overboard to make STARSHIP TROOPERS look like, for example, INDEPENDENCE DAY, from the year before, the kind of hooting-and-hollering us-versus-them supermovie that raked in cash like dead leaves throughout the 1990s. Only this movie is so totally, absolutely, completely that. It’s also a whole lout more than that, as an ingenious satire of the big dumb ugly-American blockbusters that were popular at the time (and are even moreso now — how YOU doing, TRANSFORMERS franchise?) 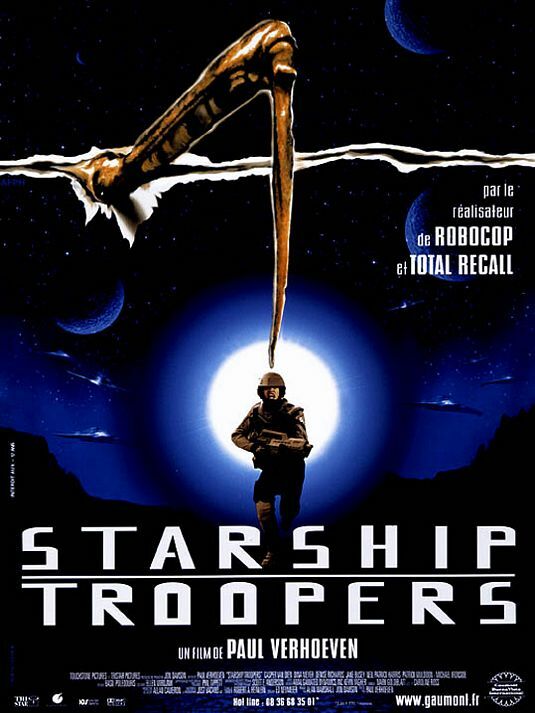 STARSHIP TROOPERS was written by Ed Neumeier and directed by Paul Verhoeven, the devilish tandem previously responsible for ROBOCOP, one of the great satires of the 1980s or any decade, really. These guys have the tools — state-of-the-art special effects, smooth cinematography by Jost Vacano, crisp editing by Mark Goldblatt and Caroline Ross (TERMINATOR 2: JUDGMENT DAY), a triumphant score by the late Basil Poledouris (CONAN THE BARBARIAN) — to produce a thoroughly rousing action epic, and the brilliant perversion of STARSHIP TROOPERS is that they totally did. STARSHIP TROOPERS is as well-made, visceral, and stirring as any other action film of the 1990s, even predicting the disturbing carnage of SAVING PRIVATE RYAN by a year, but while it’s played straight, its soul is anything but earnest. STARSHIP TROOPERS was originally a novel by Robert Heinlein, which I haven’t read, but by every account it’s not a very faithful adaptation. The basic premise is that in the distant future, humanity is colonizing planets and facing competition/resistance from literal giant “bugs” whose home planet is excellently named Klendathu. As the story opens, this war against the bugs has been going on for years, and human teens are recruited right out of high school to enlist and see combat. Military service is expected of them, and also generally desired by them. Most of the kids in the movie are totally enthusiastic to sign up and suit up. One reason is that the armed forces are co-ed, which, because this is a Paul Verhoeven movie, means shower scenes. The other reason is that these bugs are nasty — gigantic, spiky, slimy beetle things — which of course stands in counterpoint to the almost-comical prettiness of the movie’s heroes (including a pre-Charlie-Sheen Denise Richards, and not counting Jake Busey). STARSHIP TROOPERS confused mainstream audiences and humorless critics as much as it delighted those with sensibilities more finely attuned to skepticism, cynicism, and irony. The original release is often classified as a “flop”, which isn’t technically true — it made money, but only a little, which isn’t viewed as a success because of how much it cost. What is true is that many of the “straights” were turned off to STARSHIP TROOPERS. Here in America we seem to like our blockbusters the same way we like our wars: Unambiguous, neatly resolved, with as little consideration as to the thoughts of the enemy as possible. Verhoeven uses conspicuous facist imagery straight out of Leni Riefenstahl in his depictions of the surging Space Marines, and unsurprisingly many critics of the movie missed the point. The masses don’t much enjoy these sorts of dangerous ideas either. We want to see our armed forces as Captain America, and everyone they battle as The Red Skull. I’m not necessarily criticizing that instinct. I’m the same way. But I also happen to believe that the point Neumeier and Verhoeven are making is a viable one: That war is violence, and engaging in violence makes monsters of all of us. If you disagree with me, I invite you to see how you feel after reading this news article which I read just this morning. If we really love our troops, we can show it by not sending them away to face (and occasionally to become) monsters if it isn’t absolutely necessary. Or we can just keep on squashing the bugs and enjoy watching those green guts ooze out. There’s plenty of fun in that too. STARSHIP TROOPERS is playing at 7pm tonight at the 92Y Tribeca screening room. Screening In NYC: THE GREAT NORTHFIELD MINNESOTA RAID (1972). Screening in NYC: DEMOLITION MAN (1993).